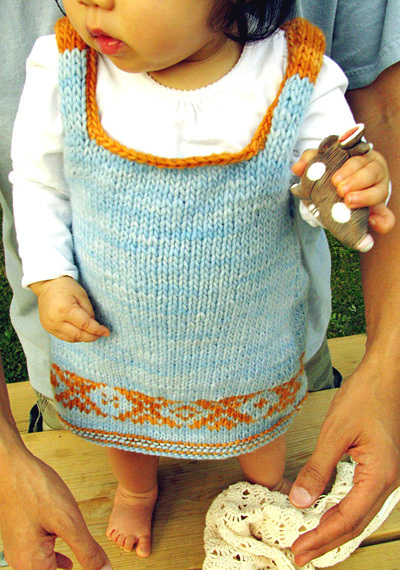 I wanted to make my baby a dress which was easy and quick but really eye-pleasing. 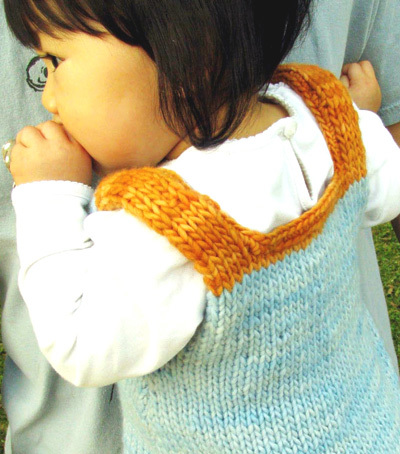 So here is my Topaz, sleeveless baby dress for the cooler weather with simple diamond pattern. 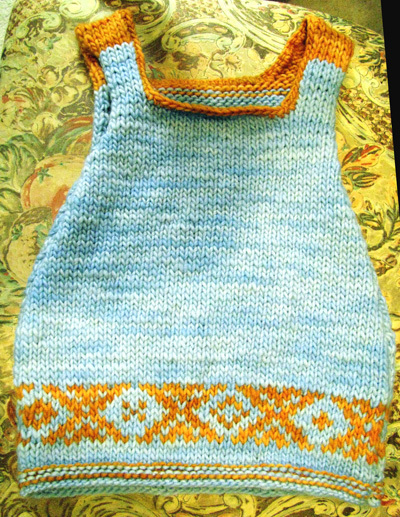 This will be a perfect project for knitters who want to attempt incorporating a little color into their work—Fair Isle-like diamond pattern which actually uses only 1 CC and is completed in 9 rows. Instead of using multiple colors in repeating diamond pattern, we create non-repeating 4 different diamonds, which will keep you concentrated and rewarded for the result even we do only 9 rows! There is also change of colors at shoulders and back around neck to give some accent to whole dress. The combination of 2 semi-solid color single ply yarns makes individual stitches to look dynamically flowing and alive, you’ll never get tired of looking at them. Using MC, CO 50 sts. Row 1 [RS]: K all sts. Join CC. Rows 2-3: Using CC, k all sts. Row 4 [WS]: Using MC, k all sts. Rows 5-8: Using MC, work in stockinette st, ending with a WS row. Work Rows 1-9 of chart pattern. Break CC. Using MC, work 1[1, 9, 9] rows in stockinette st, ending with a WS row. Decrease Row [RS]: K1, ssk, k to last 3 sts, k2tog, k1. Repeat these 4 rows 7[7, 6, 5] times more. 34[34, 36, 38] sts. Continue in stockinette st until work measures 9.25[9.25, 11, 12.75] inches or desired length to underarm, ending with a WS row. BO 3[2, 2, 2] sts at beginning of next 2 rows. 28[30, 32, 34] sts. Continue in stockinette st until work measures 10.5[12.5, 14.5, 16] inches, ending with a WS row. Break MC and attach CC. Using CC, work 2 rows in stockinette st.
Next Row [RS]: K8 and place these 8 sts on st holder; BO 12[14, 16, 18] sts, k to end. 8 sts. Work these 8 sts in stockinette st until work measures 13[15, 17, 19] inches. Break yarn, leaving a tail approx. 8 inches long, and place sts on st holder. Place held 8 sts of right shoulder on needle and reattach CC with WS facing. Work in as for left shoulder. Work as for Back to beginning of armhole shaping. Work 8[10, 10, 12] rows in stockinette st, ending with a WS row. Work 7[9, 9, 11] rows in stockinette st. Break MC and attach CC. Continue in stockinette st until work measures 13[15, 17, 19] inches. Graft to held sts of back right shoulder. Place held 8 sts of left shoulder on needle and reattach MC with WS facing. Work as for right shoulder. Note that measurements shown include selvedge sts, and represent dimensions before sewing side seams. Using CC, work 1 row single crochet around neckline edge. Sew side seams and weave in ends. 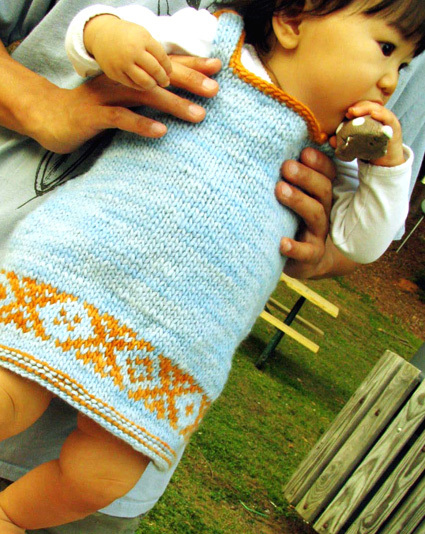 Yumiko’s passion for knitting developed rather suddenly when her friend presented her with a pair of knitted booties for her daughter. Since then her mind has been filled constantly with all kinds of knitting fantasies. You may find her in the LYS, sitting on the floor Japanese style, staring at the yarns for hours. 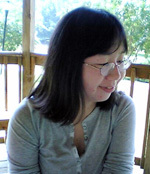 Otherwise she is a researcher in a biomedical engineering lab and a mom with two kids.